Beauty oils really pack a punch and are fantastic moisturisers for face, body, hair and nails. They work well as part of a daily routine or once a week as a nutritive mask. They can also be used on all skin types, even oilier ones. Facial oils can be used all over the face, including the eye and lip area (however, if you have sensitive eyes, check for ingredients in case natural scents cause you irritation). They really are a cocktail of replenishing vitamins and leave the skin soft and silky. Use two or three drops and massage well until it's absorbed. Once it's all been soaked in, apply your eye cream and moisturiser. Created by renowned Italian Dr Mario Spiezia, a skin expert, Inlight Beauty is a cruelty-free, Soil Association certified organic and ethical beauty brand. Their Face Oil, £39, contains blue mallow, jojoba and rosehip oils and can be used every day, even under makeup thanks to its lightness. It's easily absorbed, moisturises instantly and smells divine, thanks to its extract of rose and vanilla. It can be used on all skin types, it's 100% organic, vegan and is leaping bunny certified. 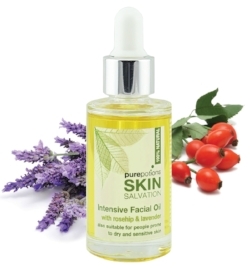 Those with dry or sensitive skin will benefit from PurePotion Skin Salvation Intensive Facial Oil with rosehip and lavender, £22. It's packed with grape seed, rosehip, lavender, calendula and camomile oils, vitamin A, E as well as omega 3 and 6 and works well on dry patches and eczema too. It's gentle enough to be used every day and has a moisturising and calming effect. Made with 16 therapeutic oils including sea buckthorn, soybean, sesame, jojoba, coconut, grape seed, meadowfoam, borage, rosehip, castor bean, andiroba , shea, avocado, plant-derived squalane, wheat germ and hempseed, and packed with antioxidant, BioVerde Miracle Skin Renew Skin Perfecting Oil, £14.94, is an all-rounder in a bottle. It can be used on the face and body and is particularly effective against tired, dry and dull skin, eczema, dry patches, nappy rashes, burns, sunburns and dry, itchy scalp. I don't fare too well under the sun, and after a week away Spain in August, I came back with very dry skin. Desperate to restore it to its previous condition I used this oil in the evening and the morning after I already saw the effects: my skin was replenished, fine lines looked less pronounced and that tightening feeling that you get when your epidermis is parched was completely gone. I've been using it ever since. InfiNatura Cura Oil, £34.99, is another must have for the bathroom cabinet and can also be used on face, body, nails and hair. It uses oils of camellia, argan, sunflower, bergamot, red mandarin, geranium and vitamin E and works as a moisturiser, conditioner, decongestant and anti inflammatory. The brand recommends it not only to soften and nourish dry skin, but also for stretch marks, acne, psoriasis and nails. 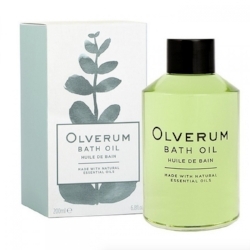 Juniper, lavender, eucalyptus, lemon, rosemary and Siberian fir needle oils make Olverum, £29 for 125ml, not only a moisturising bath oil, but also a spa for the mind. Just add a few drops to your bath, relax and let the essential oils and calming scent do the work. This luxurious bath oil was created in 1931 and it comes in a beautiful, timeless bottle that you'll want to show off on your bathroom shelf. Available online and at Harvey Nichols, Fenwick and House of Fraser online. Vegan Society and Peta certified Alchemy Oils are inspired by the Indian Ayurvedic practice of oiling where oils are used to massage the scalp to promote blood circulation. Their oils can be used as a mask to add shine, softness and to combat frizziness and breakage. They can be used on all hair types and are completely natural with no parabens, sulphates or other chemicals in sight. The Grapefruit Hair Remedy, £24, smells fresh and zingy and is used to strengthen and condition hair, whilst the Peppermint Hair Remedy, £25, penetrates in the hair follicles to stimulate growth. There's even an oil for brows, the Peppermint Brow Remedy, £21, created to help eyebrow hairs grow back if you've gone gung-ho with the tweezers. Oil cleansers are exceptional at removing makeup and grime whilst leaving the skin soft and moisturised. For a DIY remover, simply massage a teaspoon of coconut oil into the skin and see your maquillage melt away. Flaxseed oil is very good too, although the high concentration of omega-3 fatty acids will leave a faint, slightly fishy smell - not to everyone's taste. Purepotions Skin Salvation Omega Rich Cleansing Oil, £18.50 (more of which here) is light and can be used by all skin types, whilst Skin Revivals Organic Facial Cleansing Oil, £12, is a thicker oil that works wonders on very dry or mature skin (read the review here).